The Aphix Invasive is a Vex programming type that can be identified by their distinct red frames and the spiky protrusions on their heads. Little is known about the Aphix Invasive as units of this type are rarely encountered by Guardian forces. Units of this collective include Fanatics and Supplicants, both of which can be found in the Vault of Glass. The collective also includes several Axis Minotaurs who also appear in Public Events, with one such Minotaur appearing in The Nexus Strike. They also appear in the Prison of Elders. 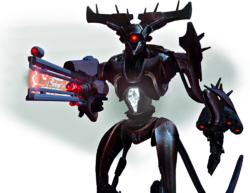 Considering the Aphix Invasive's presence in the Vault of Glass alongside that of the Vex Gate Lord Qodron, it can be inferred that they are a sort of security force, defending high level Vex leaders and structures that would otherwise be left to members of the Hezen Protective.